Publisher/Date: Scholastic Press, an imprint of Scholastic Inc., c2015. Joseph Jervis has run away from his boarding school and seeks asylum at his uncle’s house, whom he has only met once. His Uncle Albert lives a peculiar and secluded life surrounded by old furnishings, clothes and toys in a house that has never been updated, with sounds coming from the walls. Joseph is not allowed to touch anything while his uncle tries to figure out how to reach Joseph’s unreachable parents and what to do with the wayward teen. But clues as to the secrets and stories the house is whispering about prove too tempting for Joseph, and he delves into the history of the house and his family. Things aren’t adding up though, and Joseph must finally confront his uncle to get the answers he so desperately desires. First, let’s chat about production quality, not something I typically address on this blog. 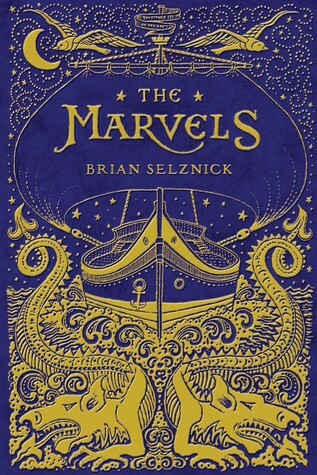 The cover is glowingly embellished with contrasting gold lines against a navy blue background. The gold tones are continued onto the edges of the pages. While this makes for an impressive and imposing view from the side, it was more difficult to call it a true page-turner as the pages of my freshly arrived copy stuck together throughout. I doubt the next person who checks it out will have that issue, but it was frustrating as a first reader. A coworker did remark that you had a much more difficult time telling when the sections of print and pictures started and stopped, although if you look closely enough or fan the pages slightly there is still a noticeable color difference. Continuing the trend started with his previously published titles, the spine and back cover features the main character’s face, although we don’t see this particular piece of artwork until the last pages of the novel. Selznick as usual has spared not a single detail, down to the inside of the covers, as the front part features stormy seas and the inside of the back cover showcases a stunning sun over the ocean, giving readers a glimpse of the tempest (pun intended which readers will understand once they read the book) to come and the calm that comes by the end. Whether it’s setting or rising is anyone’s guess, but I think it could be interpreted either way. In the author’s note, he addresses the spelling of words as the British version, which I occasionally noticed but some might not, as an effort to keep the story firmly anchored in its British influences and history. I think this position is beautifully unique and admirably authentic considering how frequently those changes are made, such as the alterations made to J.K. Rowling’s works when they were imported. Now, onto the story. I won’t say I didn’t like it, but it was more thought-provoking instead of awe-inspiring like his two previous works. In Hugo, we had a ground-breaking format, and in Wonderstruck there was a thought-provoking concept. In The Marvels, we have a story inspired by fact but also providing commentary on the nature of inspired-by-fact stories. What is truth and what is fiction, and how do we determine the difference? Is it really so important to separate the two? I loved what could possibly be the motto of the book, “You either see it or you don’t”, as a straight-forward observation that could be applied to not just physical elements of life but also more conceptual aspects. For instance, in terms of the We Need Diverse Books movement, this is another example of it being there (in this case homosexuality), but not being the main focus of the book, subtly riffing off the “You either see it or you don’t” theme. It’s okay if readers caught it, but it’s also okay if they don’t, as it’s never explicitly stated within the story. As much as I love the illustrations Selznick put together for this work, they felt redundant this go around. With the inclusion of all the pictures to tell the story from the past, everything we previously witness through the preliminary pictures is spelled out in detail later on in the book. I’m interested to hear from other readers if having the pictures interspersed in the narrative instead of initially presented as a cluster would have changed your perception or enjoyment of the story. It’s understandable their inclusion is meant to more thoroughly engross readers into Joseph’s life and discoveries, to literally see what and how he sees and feel just as confused, frustrated, disappointed, and conned when the truth is revealed. But there is already a layer of separation for us the reader since we know this story we’re reading isn’t true, so I feel like the betrayal when it does come in the climax is never going to impact readers as thoroughly as it does Joseph. Instead I’m scratching my head and find myself referencing Rowling again, comparing the whole story to that one line of Dumbledore’s in Harry Potter and the Deathly Hallows when he asks Harry “Of course it is happening inside your head, Harry, but why on earth should that mean that it is not real.” (723) I thought the real twist comes not with Uncle Al’s reveal, but with Selznick’s author’s note delineating what aspects of the story are inspired by real life events and people. In this way there’s almost two plot-twists, which might mean readers’ heads are spinning. Fans of Selznick’s previous works will be satisfied with this slightly circuitous story, but the revelations are what is truly memorable about this read.